Now, one thing we couldn’t pass up while we were in Rio was exploring one of the favelas. They are such a huge part of Brazil’s culture and history that it would have felt like we hadn’t seen the raw Rio without visiting… and we may have seen City of God a few times, so it was a bit of a quirk interest. Before heading on the trip, we hadn’t really given it much thought because we had been flat out since arriving in Rio. We hadn’t felt unsafe our entire trip, so we had slightly forgotten about Rio’s darker side. We booked our trip through Be a Local, one of the tour companies which have an agreement with the locals to enter the favela and be given safe passage. It is strongly advised not to enter any favela alone. We were picked up from our hotel early and we were taken to the top of Rocinha, the biggest favela in Rio with an estimated population of around 70,000 people from a 2010 census but some say it’s as high as 180,000. The views from the top of the favela were absolutely stunning and completely awe inspiring. Beneath us was a sea of buildings of all different colours and a cat’s cradle of allies running between them. At this point all we could feel was pure excitement and we wanted to delve right in. But, before we started to walk through Rocinha we were given a couple of strict rules to follow to the T by our tour guide. First, we weren’t allowed to have any cameras or phones on show in case the locals thought that we were documenting the happenings inside the favela. Locals don’t allow police or any kind of authority inside the favela and they forcefully don’t allow anyone spreading information. Secondly, we were not allowed to stray from the group. We had to stay tightly together and not fall back, if we were seen without the tour guide we could have been in serious danger as the locals would be suspicious as to why we were there. We found out later that nearly 6,000 people go missing a year in Rio and most of these cases are inside favelas such as Rochina. At this point even, the stern tone of the guide couldn’t have dampened our mood, we were insanely excited. We started walking through the favela and it was a complete maze. Cobbled allies running in all directions, ducking and weaving between little houses. There was a net of wires above our heads at all times and open water systems trickling around our feet. There were cat’s dancing around our toes and all sorts of smells wafting around, some beautiful and then some not so much. The tour guide took us to a number of different locations throughout the tour. There was an incredible contemporary art gallery which housed a lot of the local’s work. We were also taken to a corner shop where we got to try some true Brazilian home cooking and a school where we were able to meet some of the local children. We even got a see a local band busking along one of the allies. Rocinha had an amazing energy and positive vibe. Again, like the rest of Rio we weren’t in any way feeling threatened or unwelcome. But this was all about to change. We had been walking for around an hour and we were about half way through Rocinha on our way down to the bottom. We had accidentally fallen to the back of the group but were very aware that we needed to keep up with the pack – which we did. We didn’t even stop to stroke the kittens which showed a lot of self-restraint. Suddenly, we were paused by our guide and asked to take a step back against the wall. Everyone did straight away as there was a cool tone in his voice which told us to obey. The guide then proceeded to tell us that there was going to be a man walking past in a minute who would have a gun (he had just received a call on his radio). The guide was calm, so we didn’t think too much about it and simply waited for further instructions. Going back to City of God we were expecting a grown man with a small handheld pistol tucked into his jeans – yes, we need to stop watching too many movies! What we saw we never expected to see in a million Sundays. A couple of minutes later a young boy no more than 13 or 14 walked past with a huge automatic machine gun. Now, we have obviously seen guns before but in the arms of trained police or army personnel. Never in the hands of a child. This we have to admit shook us slightly but as soon as he had passed the guides demeanour picked up and off we went again as if nothing had happened. Throughout the rest of the tour we came to see why there wasn’t more of a fuss made, we saw child after child walking around with huge weapons sometimes nearly as big as them. It was only now we were starting to see all the damage to the buildings caused by gun fights and the propaganda sprayed on the crumbling walls by the different gangs which fight for turf in the favelas. The most jarring experience was towards the end of the tour when we walked into a sizeable opening (for Rocinha) and there were five boys sat on white, plastic garden chairs all holding their own automatic weapon. Their eyes never left our backs and our eyes never left the ground. By the end of the tour we had probably seen roughly 25 to 30 automatic weapons never in the hands of someone older than a teenager. We have to admit we sighed a sigh of relief as we walked out of the favela and past the armed police who surround the favela 24 hours a day. It was one of the most real but incredible experiences we have ever had. It completely opened our eyes to the darker side of Rio and in some ways completely broke our hearts that children were caught up in a lifestyle so destructive. We think that the reason why we were scared of the children with the guns was because they were so young how could they fully understand what they were doing? Also, them being thrown into a reputation driven environment where violence is a rite of passage – would they do something for a wrong look? We spoke to the guide afterwards to find out more about the safety element of the tour, something we hadn’t given two seconds of thought to before the trip. He had been travelling into the favelas for a couple of years after having built a strong relationship with the locals. The deal was the tourist spend money in the gallery and the shops and they are therefore allowed to walk through. He explained he had encountered tricky situations before where he has had to divert the route due to gun fights having broken out and he also admitted to tourists having been robbed because they had fallen back and lost the group. It made us realise it is so important to understand what you are getting into when arranging something when travelling which we did not when arranging this trip. After the trip somedays we cursed ourselves for being so uneducated and for putting ourselves into a potentially quite dangerous situation but on other days we celebrate our naivety as otherwise we might have dismissed it as being too dangerous and never of had the experience. It is something that we would recommend highly if travelling to Rio and we have to say Be a Local were absolutely fantastic the whole way through. As we said the vibe throughout most the favela was that of positivity and the people which we met were kind, warm and funny. 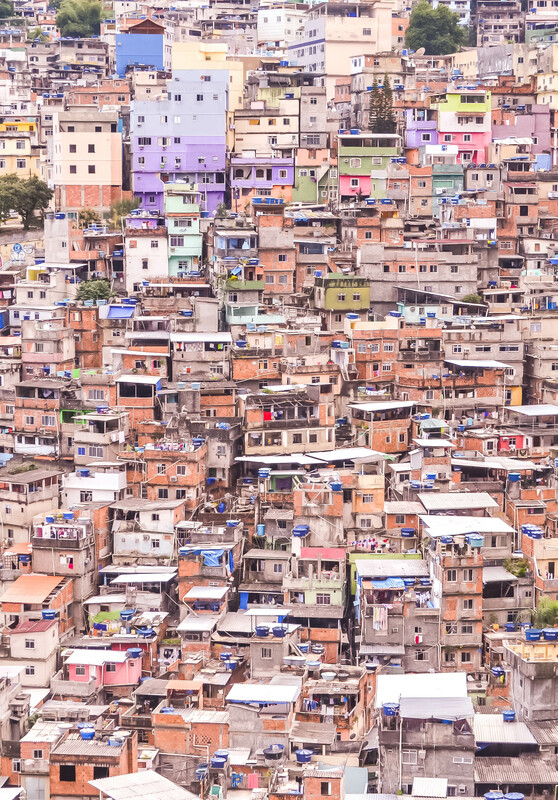 A huge portion of Rio’s population live in favelas so the reception staff at your hotel or the waiter at your restaurant probably returns there or somewhere similar every evening. We would say just be prepared for what you are going to see, there is a darker side and it can be scary, you are the only person who knows if it is something you want to see.